During my field observations of the brown bears, I have had very little opportunity to observe parents and offspring interacting, with the exception of one instance, in my post on Momma & Baby Bears. However, as I mentioned recently, Explore.org, the group responsible for hosting the live cameras, also provides a handful of highlight videos from this year and past years, which allows viewers to see footage of different activities they are less likely to stumble upon via the live feeds. In order to learn more about the parent/offspring interaction, I utilized one of their highlight videos, entitled “402 Reunites with Her Missing Cub”. In this video, which is quite short (only slightly longer than 2 minutes), we see a relatively small bear cub by itself at the beginning of the video, which sits on the side of an embankment and seems to call out a few times. Shortly thereafter we see the momma bear arrive and the two are reunited. Today was an exciting day of bear watching! I actually had just turned on the bearcams to show my husband what I had been doing for my field observations, and when I pulled up the second camera at the Lower River, I was shocked to see a momma bear and two baby bears in the river! 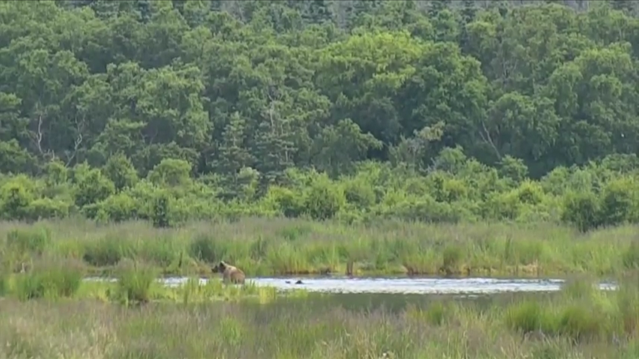 So a casual glimpse at the bearcams turned into a real field observation quite quickly! This was the first and only time I have been able to see a live shot of baby bears during my time watching the cameras at Katmai. When I first saw the baby bears, they just looked like little bumps in the water behind the larger bear. Momma bear (I will refer to her as Bear M) is mostly blonde in color, with large ears and a smallish head. She doesn’t seem particularly large, perhaps because much of her fishing catches go to her offspring rather than feeding herself. The baby bears – I believe there were only two, though there may have been three – have fur that is darker in color than the momma bear, they are a dark brown color. Momma Bear M and two baby bears in the water at the Lower River.